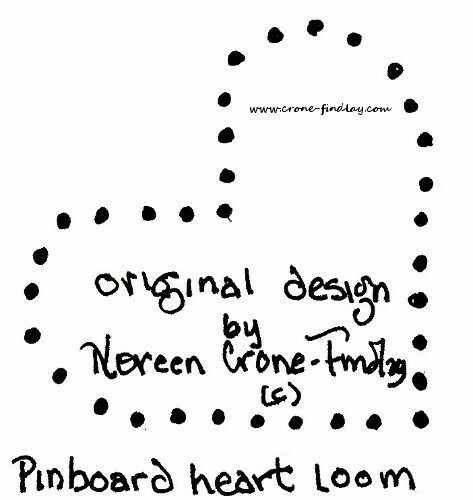 Hearts are one of my most favorite design motifs ever. 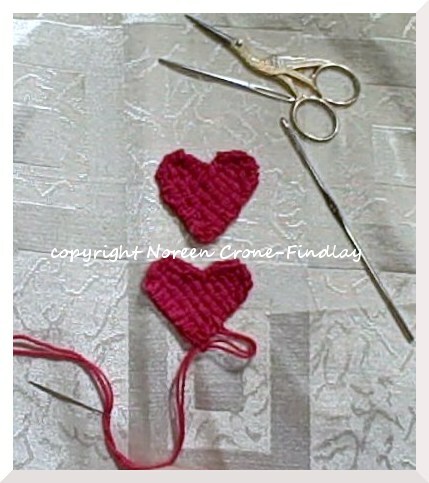 I decided that I should design a tiny little woven heart motif as a project for the ‘Stitch Red’ heart health campaign, and also work as an embellishment on a special ‘I love you’ scarf for my daughter. Materials and equipment: a square of foam (I upcycled some packing material) that’s about 4 inches square by an inch or so thick. A 3 or 4 inch square of clear plastic from a clamshell package or other recycled thingie. Knife to cut the foam, scissors. 1: Copy the pattern, and trim to fit the size of piece of foam. 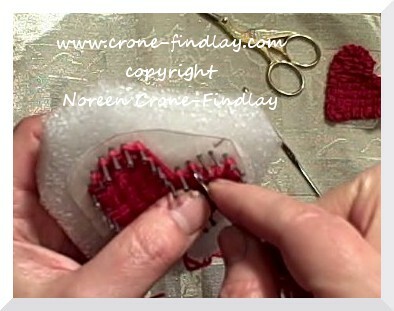 2: Place the piece of clear plastic over the pattern. Push the pins into the dots. Warping: The right hand arch of the heart is held vertical and the left hand arch is horizontal. 3: Tie 2 strands of yarn together (Note, you need to be working with fine yarn, like a sock weight) and place over the pin at the point of the heart. 4: Skip 8 pins, go around the next pin and down to the lower edge, and around the pin to the left of the pin at the point. 5: Go up and down across the 5 pins at the top and their mathcing pins on the lower edge. 6: Take the yarn up to th emifpoint pin (there are 3 empty pins above it) and down. 7: Go up and down across the next 5 sets of pins. There will be 3 vertical pins/nails left empty. Make an ‘8’ around the last set of nails to bring the yarn back down to the lower set of nails. Row 1: Weave hook from right to left: Over 4/Under 4 between the 1st and 2nd pins. Make a loop of yarn and place it on the hook, then draw it through the warp strands. Place the loop on the 2nd nail on the right hand side. 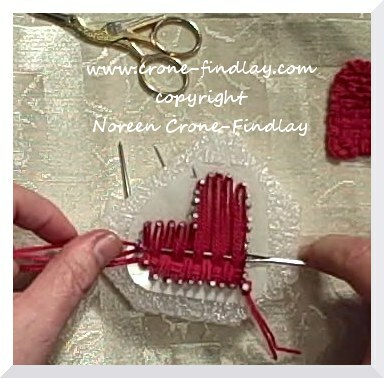 Rows 2 & 4: Weave Under 4/Over 4 across, pick up the loop of yarn, ease through, place loop on nail/pin. Row 3: WEave Over 4/Under 4 across, pick up loop, ease through, place on nail on right hand side of loom. Rows 5 & 7: Weave )ver 4/Under 4/Over 4/Under 4/Over 4… make loop, ease through, place on pin on right hand side. Note: on Row 7, the yarn passes by 5 pins before it’s woven in. Rows 6 & 8: U4/O4/U4/O4/U4 make loop, ease through, place on pin on right hand side. Row 9: Working with top 3 pins only: U4/O4/U 4 make loop, ease through, place on pin on right hand side. (It already has loops on it, but not to worry). 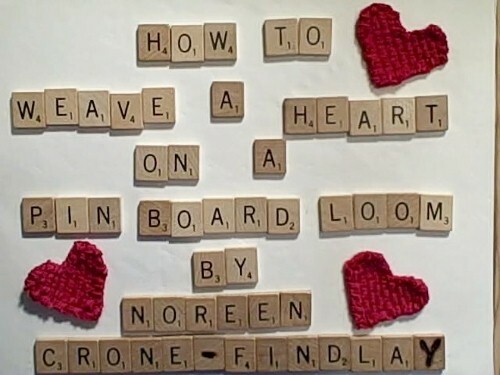 Wrap the yarn around the circumference of the heart 2 1/2 ties and snip. Working in a counter clockwise direction: Thread the yarn ends into a darning needle and lift the stitches off, one by one, stitching through them. Some nails have 2 sets of threads on them, so lift the sets of yarn off one at a time. Stitch over the long floating threads to capture them. 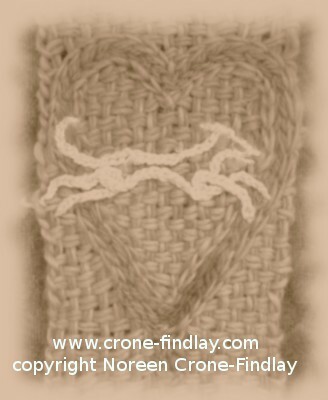 Stitch twice at the tip of the heart. Untie the beginning knot and weave in the ends. 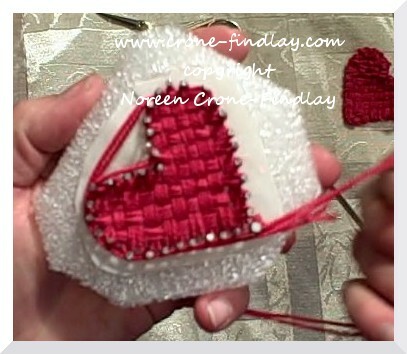 Adjust the circumference stitching to shape the heart, and stitch through the outside edge again if desired. Weave in ends and trim. The hearts can be used to embellish or trim scarves, hats, mittens, gloves, cowls, hair ornaments, bags, stuffies, dolls, toys, blankets, shawls, stoles, vests, coats, wall hangings, cellphone and tablet covers. The sky’s the limit! I think that people might like to have a heart loom in wood, so I asked Donna and Gary McFarland of Dewberry Ridge looms Link if they would make them, and they said yes, so if you want one, drop them a note. PLEASE NOTE: All content of this blog, including video, audio, written and photographed is the sole work and property of Noreen Crone-Findlay, and MAY NOT be used without my permission. Thanks so much! 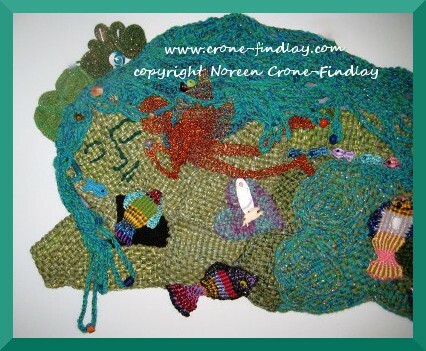 I am working on a large series of woven and mixed fiber media pieces that I am calling: Woven Women. She’s large- 6 ft by 2ft, and hard to photograph in my studio, so I figured that I would show a video of her. 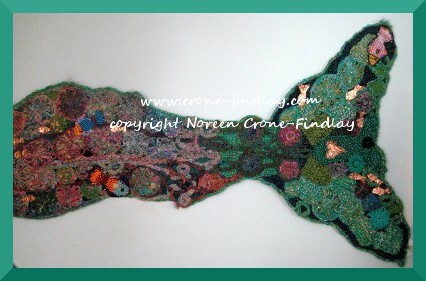 I used small looms, knitting, crochet, tatting, spoolknitting and flower looms to make her, along with copper foil work. Some of the looms were: 2 inch square vintage weave it loom, potholder loom, pinboard looms, Martha Stewart loom and flower looms. 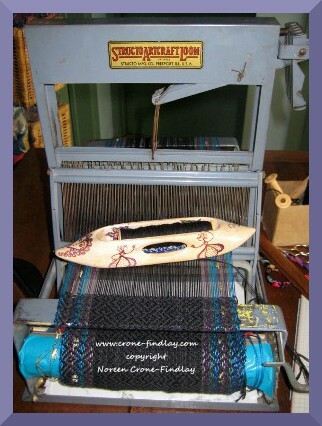 Remember: The size of your loom doesn’t limit the size of your finished piece! The other day, I had a big ‘aha’ moment. My husband is a jazz musician and composer and completely awesome bundle of wonderfulness, and I love weaving beeeeeuuuuutiful shirts for him to wear when he’s performing. (last year’s Jazz festival shirt: Link). But…. oops… it’s cream and ecru with lotsa colors…. and, the color that the guys mostly wear to perform in is black. Our daughter made Jim a gorgeous black shirt from the Folkwear Victorian Gentleman’s shirt pattern, so it’s kinda dumb to weave him another one….. sooooooooooooooo the big AHA was…………… weave him a VEST!!!!!! Ding! Lights go on, whee’s and skippetty hops and happy dances ensue…. When our son got married, I used the Folkwear pattern to make him and my hubby kilts, (oh my word.. the grooms men, hubby and our son, all wore kilts and they looked FABULOUS…). Oh oh, whenever I go on the Folkwear pattern site, it makes me want to buy more patterns. I love their patterns and have been wearing them for more than 3 decades. We actually got married in clothing I sewed from Folkwear patterns, and our children grew up in Folkwear. Okay, just had a brief noodle through their website, and am seriously in love with the Siberian Parka….. hmmmm… that would be fun to weave the fabric for…. hmmmmmm. I am in the throes of weaving up narrow bands for this vest, and loving it! The vintage Structo looms are kind of like the ‘Featherweight’ sewing machine – tiny, perfectly formed workhorses that are beautifully engineered and much sought after. Although, after I spent hours the other evening, warping the black cotton, I would have cheerfully sold the blessed loom to the first taker. (Warping black thread at night is not so much fun). Luckily, I got over my snit, and am now utterly enchanted and weaving merrily away. Which is good, as the Jazz festival is getting closer and closer…. 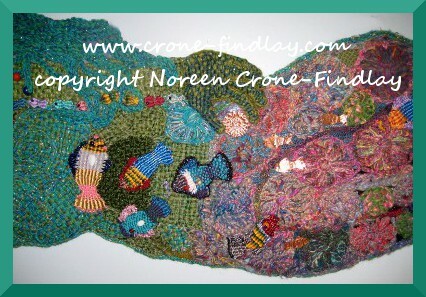 eep… I need to go meet some deadlines and then get weaving! My dear friend, Terri Bibby, is a Saori teacher and weaver extraordinaire, who told me about some shuttles that don’t have a metal rod through them. This intrigued me, so I made myself one to see how I liked it. I absolutely love it. I made it small and low profile to fit the small shed of Structo and Peacock looms. Thumbs up, indeed! I’ve just made a new video tutorial showing how to use a nifty technique to embroider motifs onto small loom weavings. 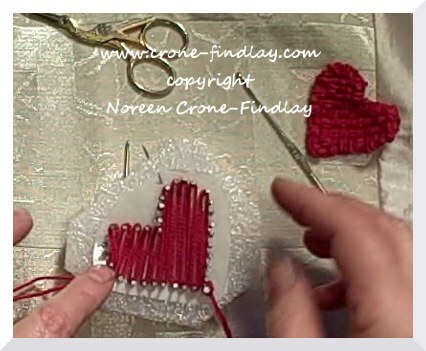 This is the first in a series of video tutorials and free projects that I will be posting in honor of ‘Stitch Red’, which is the Needlearts industry’s campaign for heart disease awareness- working to benefit The Heart Truth through the end of June 2013. I care deeply about heart health, as my mother and mother in law both had heart problems, and my mom had to have surgery on her heart. I don’t want any of us to have to go through that …. so I am very committed to helping people have happy healthy hearts! I have to confess that I am a sucker for Pandas. 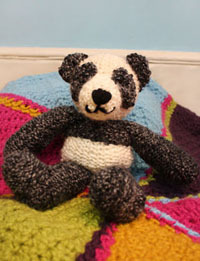 I hope that I will contribute to other people’s Panda love with this design for a Panda bear knitted on the Martha Stewart loom. 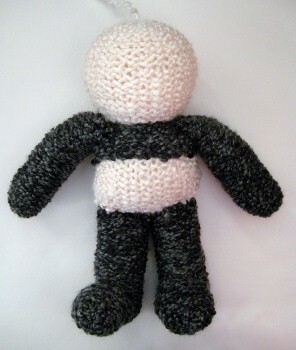 Arms: make 2: Knit 25 rounds. Cut yarn and gather last row (See Notes). Arms: Stuff the arms. Sew arms to body at shoulders. I’ll send them a note to hopefully get this fixed asap! I’ve gone silent on my blog, as the last couple of weeks have been extremely challenging. I went down with a nasty flu, and also had major design deadlines to meet. But – the hardest part of all, was that our beloved greyhound, who has been sick for more than a year, went into kidney failure and died. We adopted him from the Canadian Greyhound Rescue almost a decade ago, and he was a beautiful, loving, wonderful companion. I have been weaving pieces about him…. and will post more about them, later.